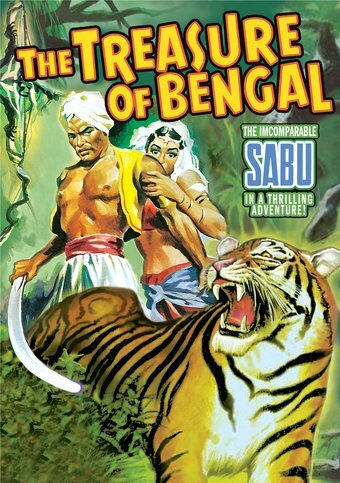 The incomparable Sabu searches for a lost Hindu treasure in this thrilling adventure, never before on DVD! The son of a mahout (elephant driver), Indian actor Sabu Dastagir (commonly known by just his first name, "Sabu"), was discovered at the youthful age of twelve by filmmaker Robert J. Flaherty (Nanook of the North). The director had coincidentally been looking for a young actor to portray an elephant driver in his movie Elephant Boy (1937), to be shot in the UK. That film in turn caught the eye of producer Alexander Korda. He brought Sabu to America, where he starred in Korda's big-budget versions of The Thief of Bagdad (1940) and The Jungle Book (1942). Both were massive hits, making Sabu one of the highest-paid actors in Hollywood. When America entered World War II, Sabu enlisted in the Army Air Force, where he distinguished himself as a tail gunner, earning a Flying Cross for his valor and bravery. His time away from Hollywood meant finding parts was difficult after the war, however, so he returned to Britain. There he landed a supporting role in Powell and Pressburger's masterpiece Black Narcissus (1947). For the most part, though, Sabu spent the 1950s making adventure films in Europe modeled after his glory days with Alexander Korda. The Treasure of Bengal, based on a novel by Emilio Salgari, is one of the most entertaining, well-made examples from this period of his career. Sabu would remain overseas until 1963, when he returned to Hollywood to appear in Rampage, with Robert Mitchum. He was planning a comeback when he died of a sudden heart attack on December 2, 1963 at the far-too-young age of 39. Child actor Georges Poujouly, who also appears in The Treasure of Bengal, garnered great acclaim for his performance in René Clément's Forbidden Games (1952).